Qingdao was founded in 1897 by the Germans who turned the city into a strategically important port, basing their Pacific Squadron there. The German Imperial government planned and built the first streets and buildings, and set up the famous Tsingtao brewery in 1903. The Germans held the city until World War I, when Japan occupied the city. 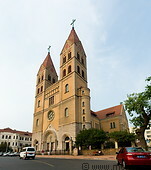 Qingdao today has many well-preserved colonial buildings.